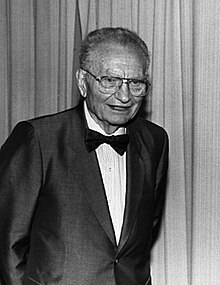 Paul Anthony Samuelson (May 15, 1915 – December 13, 2009) was an American economist of Jewish descent. He was the first American to win the Nobel Prize in Economics. The Swedish Royal Academies stated, when awarding the prize, that he "has done more than any other contemporary economist to raise the level of scientific analysis in economic theory". Economic historian Randall E. Parker calls him the "Father of Modern Economics", and The New York Times thinks of him to be the "foremost academic economist of the 20th century". Samuelson died after a brief illness on December 13, 2009, at the age of 94. ↑ Frost, Greg (Dec 13, 2009). "Nobel-winning economist Paul A. Samuelson dies at age 94". MIT News. "In a career that spanned seven decades, he transformed his field, influenced millions of students and turned MIT into an economics powerhouse"
↑ Weinstein, Michael M. (December 13, 2009). "Paul A. Samuelson, Economist, Dies at 94". New York Times. ↑ "Nobel economics laureate Samuelson dies at 94". Reuters. December 13, 2009. This page was last changed on 14 January 2018, at 18:11.